In 2019, most enterprises will rely on multi-cloud management strategies for selecting best execution venues based on workload needs and for avoiding cloud lock-in. However, there is no question that AWS has the biggest lead in the public cloud market, with a $26 billion run rate for FY18 Q3, 31 percent operating margin and a quarterly growth rate of 46 percent. Synergy Research Group’s data confirms that AWS is the global leader in public cloud infrastructure and platform services, with an overall 40% market share today. Given that AWS is the first choice for enterprise cloud migrations and deployments, how do IT teams optimize AWS workload performance in real-time, keep a lid on cloud spending and handle volumes of AWS events and alerts without hiring more staff or investing in new tools? The OpsRamp platform lets you manage availability, optimize spending and maintain compliance for AWS instances with comprehensive hyperscale management capabilities. OpsRamp’s discovery engine helps onboard AWS infrastructure and platform services using API-based agentless discovery. Enterprises can access a comprehensive list of AWS resources along with the count, availability and metadata information. Gain immediate visibility into your AWS estate with support for more than thirty AWS services across compute, storage, network, database, big data, machine learning and platform workloads. OpsRamp’s Unified Service Discovery efficiently and effectively manages cloud resources across different AWS subscriptions. You will be able to drill-down into each standalone AWS subscription and understand cost and consumption details for a specific AWS account. Figure 1 - Drive visibility for AWS resources with OpsRamp’s dynamic discovery capabilities. Figure 2 - Automate your AWS cloud operations with OpsRamp’s monitoring templates. The Nutanix Enterprise Cloud Index reports that public cloud spending will account for one-third of annual IT budgets in 2020, with 35% of IT decision makers overspending on cloud services. How do cloud operations teams keep track of AWS expenditures with actionable insights across the different account and instance types? OpsRamp optimizes cloud budgets with multi-cloud visibility dashboards and budget alerts that help application owners and business stakeholders avoid wasted spend with timely notifications. Cloud cost insights help IT teams optimize cloud purchases by pinpointing idle or underutilized AWS instances. Deliver immediate return on investment by attributing specific AWS costs using the right filters (tags, accounts, categories, services, regions, resource groups and instance types) and rightsize your cloud bills with custom alerts and cost trends reports. Figure 3 - Aggregate and analyze your cloud spending patterns with cloud cost insights. Service Maps. You can use service maps to design and understand how your applications depend on dynamic cloud infrastructure. Access clear and actionable health indicators for critical services using native instrumentation and out-of-the-box support for AWS CloudWatch. Inference Models. OpsRamp’s inference engine lets you process, analyze and correlate raw events from AWS infrastructure services. Drive better hybrid availability and performance with faster root cause(s) analysis for event storms using topology-based, clustering-based and co-occurrence based event correlation. On-Call Management. Achieve faster incident response by sending context-infused alerts to the right service delivery teams using multiple notification channels (email, text, voice, or chat). You can also automatically create an incident ticket, send it to an ITSM tool like ServiceNow or BMC Remedy and manage the entire incident lifecycle seamlessly without any other third-party tools. Figure 4 - Troubleshoot and remediate critical IT outages, instead of wading through endless alert floods. OpsRamp’s IT process automation framework lets you handle repetitive service delivery activities using event-driven actions. The runbook automation engine helps optimize routine activities without any heavy lifting so that your teams can spend their time on strategic, high-value initiatives. Remote session recordings ensure safe and secure access to AWS platform services (like Windows and Linux compute instances). You can also use audit recordings for training IT teams on best practices for AWS environments. Excited to know how OpsRamp can help you embrace cloud with confidence? Email us at hello@opsramp.com if you would like to meet with us at the 2018 AWS re:Invent next week. Find out how you can visualize, manage, and troubleshoot with actionable insights for 30+ AWS services. 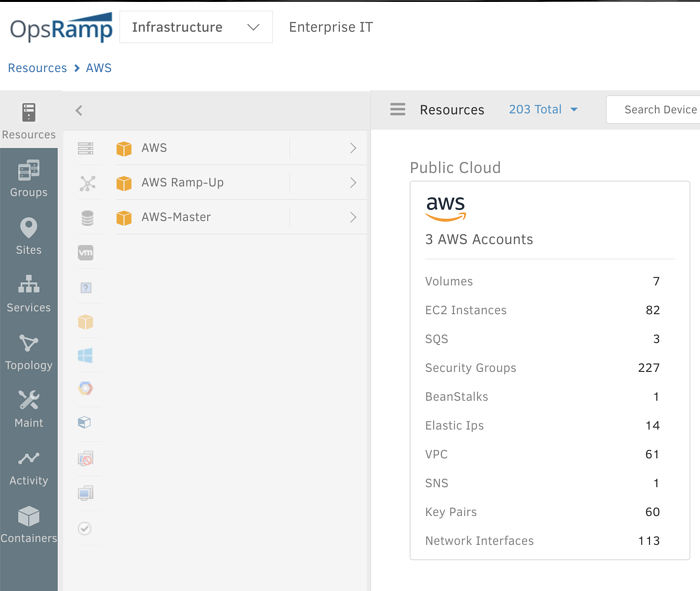 Learn how to discover, scale and optimize your multi-cloud infrastructure with OpsRamp.